I was born and raised in Brooklyn, New York, to parents who enjoyed taking advantage of the things that a large city had to offer, but had little interest in the outdoors. As a result, my first wilderness experiences occurred when I arrived at the University of Vermont to begin my undergraduate education. 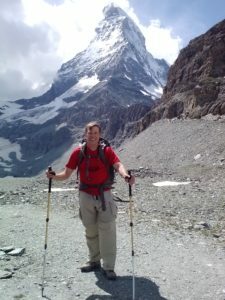 On the very first day I met Craig, Roddy, and Josh and several other dorm-mates who loved to backpack and ski. Within a few weeks of the semester start, they invited me to to join them on a climb of Camel’s Hump, a nearby mountain. Having no idea what I was getting myself into, I went wearing jeans, old sneakers, a flannel shirt, and whatever light jacket I owned at the time. 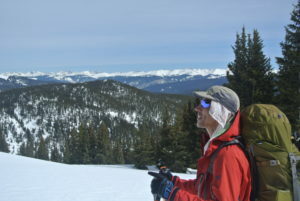 The hike turned out to be several hours of arduous climbing and the summit was blanketed in three feet of snow. I still remember being bitterly cold, wet, tired, and completely enamored with the experience. The following year we met Amy, and she quickly became part of our core group. Over the course of those 4 years I learned how to ski, hike, and backpack. I discovered the beauty of sleeping under the stars and hiking with all that I needed on my back. Meeting Amy, Craig, Roddy, and Josh, and having them as guides opened my eyes to the wonders of nature and has changed my life profoundly. For that I will always be grateful. After the University of Vermont, I went to Medical School at the University of California - Davis and followed with my residency in Family Medicine at UC Davis. 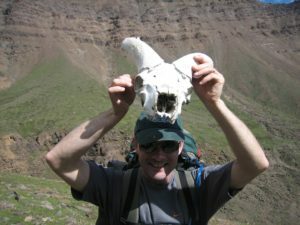 I am a member of the American Association of Family Physicians and the Wilderness Medical Society. 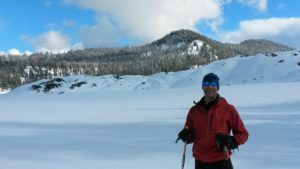 I am currently a family physician in private practice in Chico, CA, where I take advantage of the wide range of outdoor activities available in my region, from whitewater rafting to backcountry skiing and backpacking. Life is loaded with serendipity, and mine was blessed by Amy, Craig, Ross, and Roger 35 years ago. I was born in New York City and grew up in the area as a youth. In high school, my family moved to Vermont where we had a family farm and I had worked every summer since the 5th grade. I was admitted to one college, the University of Vermont. Fate has a way of working out. My closest life-long friends came from my four years there and what has turned into an every 5th year reunion in the backcountry with our particular group of five. Known as Waz or Wazua by the group (an evening of wine and laughter likely coining the nickname based on my full name, Joshua) I graduated from UVM and went on to earn a master’s and doctorate from Indiana University with positions at Northwestern University, the University of Virginia, and Indiana State University where I am currently the Associate Vice President for Student Success and Professor of Higher Education Leadership. My wife is also an administrator and faculty member at the University and we have three children, two in college and one in high school. My passion, like Amy’s, is also education. We enroll a large number of first generation, low income, and minority students at Indiana State, the exact constituency that our nation needs to serve well to ensure greater individual and societal prosperity. I am also on the board of HEMEFund, a non-profit founded by a U.S. Army medic that has established vocational schools in Afghanistan for war widows. Like Amy, I also love physical challenges, particularly when it can be linked to a good cause. In memory of an aunt who died of leukemia, I raised money, trained, and ran in the Hawaii Marathon. 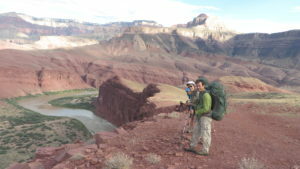 Backcountry trekking for our group has never been about taking the easy way and is filled over our 35 years with a mix of exhausting climbs, harrowing ledges and precipices, an occasional near death experience, and blisters and muscle strains that seem only to get more intense as the years creep onward. Yet, it isn’t those things that have been the most memorable for me; rather, it is the laughter that always accompanies our trips. Inspired by Amy and Craig, who from freshman year in college had the amazing ability to make themselves, and others, laugh until you cry, our group does exactly that. Early in a trip, the humor is often directed at me, the flatlander from Indiana, who insists on dragging a box of wine with him for us to enjoy during the first few days despite how wrong that is from a weight perspective. That wine, however, at the end of a hard day, helps to take the edge off and loosen us all up. We find ourselves telling stories, some new, some well-remembered, but ones that through the elixir of laughter remove for that moment the stressors of life – mistakes made, relationships imperiled, regrets recalled, personal health challenges confronted, societal intolerances and inequities observed or felt. The academic in me knows that laughter has enormous individual and group benefits, and we often do not get enough of it. Charlie Chaplin once said, “A day without laughter is a day wasted.” Our trips fill me up in ways nothing else does. 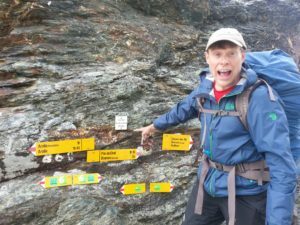 Hiking and Backpacking – the elixir of my life! 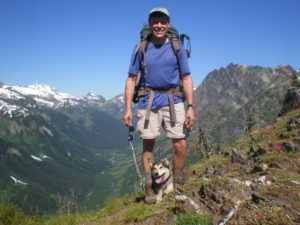 I have explored the heights of the Alps and the Canadian Rockies, the depths of Hells Canyon and the Grand Canyon, the wilds of Alaska and British Columbia as well as my own backyard mountain range – the glorious North Cascades. 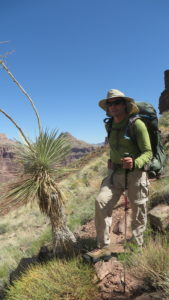 Hiking and backpacking adventures have been and continue to be a central feature of my life. Many of these adventures I have shared with my friends Amy Daniels, Josh Powers, Ross Nayduch and Roddy Lewis. We met in college, discovered our mutual adoration of and attraction to high and remote places and began on a journey into the wild – together. I was born and raised in New Hampshire and educated at the University of Vermont. After college, I spent nearly twenty years as a public servant in my career as a Federal Investigator with the U.S. Consumer Product Safety Commission and in several international trade focused positions with U.S. Customs and Border Protection. I have written and published my memoir, “Freedom from My Self – Moving beyond the voice in my head.” The book documents, among other things, my journey with a chronic and incurable disease known as Recurrent Respiratory Papillomatosis (RRP) - a disease which has diminished and frequently takes away my ability to speak. Over the course of the past 24 years I have had 78 surgeries to remove tumors from my larynx, trachea and vocal cords. Presently I live with my partner in a small mountain town up in the Cascade Mountains of Washington State. I devote much of my time and energy as a volunteer to the local food bank and library, land and water conservation efforts and parks and recreation. The five of us were running hard up the tundra slope, weighted down with fifty pound backpacks, trying to catch the bush plane at the top of the ridge. Storm clouds were moving in, we were running late and that plane was our only way out of the wilderness. We had been backpacking cross-country for a week, navigating the high country of Wrangell – St. Elias National Park in Alaska. The bush plane had dropped us off in the middle of nowhere a week ago, and we had traversed some exceptionally wild and raw country. We were now striving for our pick-up coordinates, where the bush plane would land and take us back to the Alaska front-country. We heard the strain of the plane’s engines and then saw it position itself for a landing on a small finger of tundra at the apex of a high mountain ridge. The pilot barely stopped the plane at the end of the grass covered runway, when we realized that we had to hike HARD to get to the plane. We were not sure if the pilot would wait for us, due to the weather conditions. Hearts pounding and legs straining, we ran up the tundra slope. I saw the pilot get out of the plane and he began to gesture wildly. With his arms flailing I heard him exclaim, “Hurry, the weather is closing in fast.” We reached the plane with barely a breath left in our bodies when the pilot yelled, “The weather is too intense, I can only take three of you.” There were five of us. Amy, Josh, Roddy, Ross and I looked at each other and made the hastiest of decisions based on the most immediate of moments. Ross and I would stay behind. The pilot loaded Amy, Josh and Roddy’s backpacks into the plane and yelled to Ross and me, “I will be back for you two later, if I can. We watched our friends quickly climb into the bush plane. The engine roared to life and in an instant, the plane thrust itself into a stormy headwind. It gained taxi speed across the tundra runway before lifting off into the threatening skies. Ross and I watched as the plane tipped and bounced, disappearing into the approaching storm clouds. And then, we waited. We watched the weather close in. We spoke to each other, “This is not good, he will not be able to land in this storm! He may not be back tonight, what should we do?” It was a conundrum. We could not set camp because if he came back, we would not be ready to jump on the plane. If we didn’t set camp, we would be hit by the full fury of the oncoming storm without shelter. Finally, we chose to unpack the tarp of our tent and huddle under it. That way, we would have some protection from the wind, rain and snow, yet be able to react quickly if the plane came back for us. We wrapped the thin tarp around us and waited. The storm intensified. To our amazement, we suddenly heard the faint sound of a whirring engine. The plane was on the way back to us! We threw the tarp off our bodies, drew it up into a small ball and threw it into a backpack. We looked skyward and caught sight of the plane. It banked sharply to position itself to land on the ridge again. As it approached we could see the storm winds jostle the tiny aircraft. We watched as the pilot eased the plane toward the runway and set up for a landing. He struck the runway and set one wheel down. Just as he did, a cross wind erupted across the ridge, hit the little plane and blew it completely off the runway! We watched it lift feebly back into the atmosphere, tilt away from the ridge and disappear into the Alaska sky. Stunned, Ross and I looked at each other. We knew that there would be no ride out of the Alaska wilderness tonight. The skies grew darker and the storm intensified. We unpacked our packs, set up our tent and braced ourselves for a stormy night. In my life journey I have been drawn to people committed to making a difference in this world. These people typically exhibit a passion and vulnerability that inspires me. For last 35 years I have been blessed to travel this path with Amy, Craig, Josh and Ross. 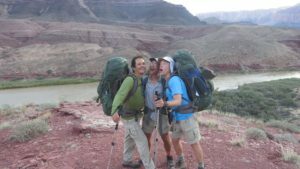 Our experience in college in the wilds not only helped me to better appreciate the beauty of our world, but also the beauty that we each bring to world and the great power of friendship. I was born in Rhode Island and grew up on the shores of Narragansett Bay. My parents met on a ski train in the late 50’s; so when the snow started to fly my parents packed us into the 9 seat station wagon and we headed north to the White Mountains of New Hampshire. I loved the beauty and wildness of the mountains (much like the sea, but that is another story). 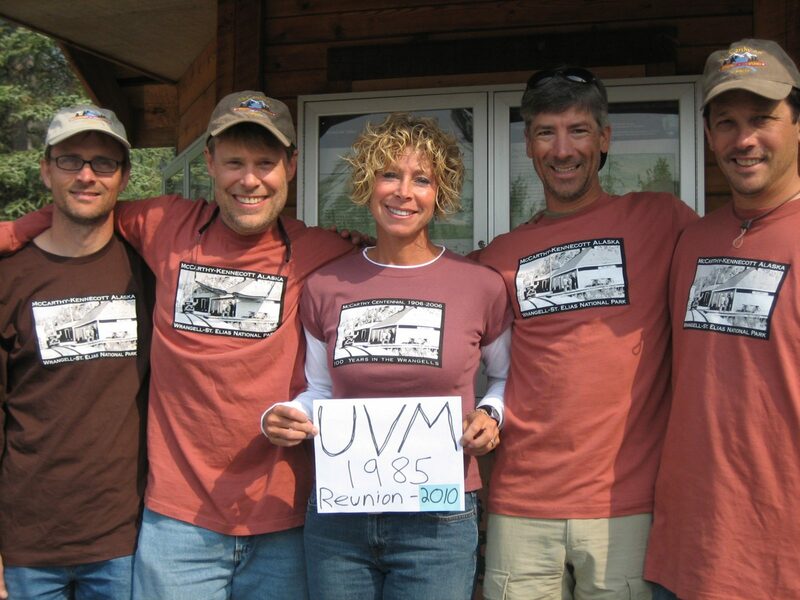 When it was time to head to college, I visited the University of Vermont with the mountains and water…. I found my place. Little did I know that I would meet some of my closest life-long friends a few months later. I met Amy, Craig, and Ross my first years at UVM. A typical freshman, I stumbled forward trying to make sense of this new world with all these new people, trying to find myself and my place in this world. Our initial college experiences at UVM connected us, but it was in our shared experiences, both on and off campus, that our little family of friends truly bonded. Our journey beyond campus took us from the local slopes of Camels Hump and Mt Marcy to the snowy slopes of Mt. Washington, from the shore of Lake Champlain to the back woods of New England. Why did we leave the confines of Burlington and our beautify campus? I do not know. 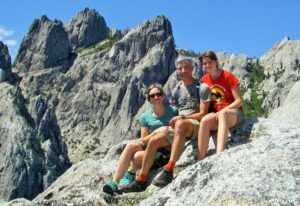 May be it was Craig’s deep passion for the mountains, or Josh’s connection to his beloved Vermont farm, or Ross’ (the city boy from NYC) willingness to try anything (almost), or Amy’s infectious joi de vivre. I am not sure that the reason matters. I do know this - our shared experiences have helped me to better appreciate the good people in my life. Our naïve college connections have evolved into beautiful bonds inspired by the wild. 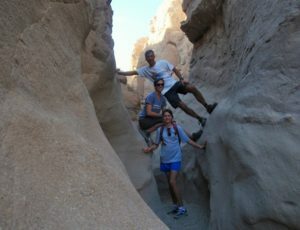 The Kilimanjaro trip and raising funds for education is exciting and so Amy! Good people, the young people of the community, our future leaders, deserve better. Why not climb a mountain? !# In this busy, fast changing world we need to take time to step back and reflect on what is important and where we are going. The highest peak in Africa is attention grabbing. The long journey may not be inviting to all, but the excitement of summiting a great peak and supporting one another on the journey is a metaphor for our educational challenges. This trip is about a journey to not only raise funds to provide better learning tools for the young people, but also to help us see to the beauty and possibilities in the community and the greater world. Known as Roddy by the group (a nickname that my parents gave to me at birth – my real name is Roger). I worked in a family business managing rental property before completing undergraduate studies in management engineering at the University of Vermont. After college, I served as a water resource/rural development volunteer in the Peace Corps in Mali, West Africa. Over the past 25 years I have worked in the community development field. This work included a wide range of experiences: real estate development and organizing with a small start up nonprofit working in an urban setting in the northeast, managing and directing assets for a growing community development corporation in Boulder, CO, and directing a national organization working on land stewardship and national housing policy. In 2012 I completed the Achieving Excellence (AE) in Community Development Program at Harvard University – this performance focused leadership approach, helps leaders to more effectively deal with adaptive changes. This inspired me to open a consulting and coaching firm, Roger Lewis & Associates where I work with leaders and their teams across the US to not only sustain their work, but to thrive in these challenging times! I live with my wife and 3 children in Boulder, CO - a property that I designed and built in 2001 with my wife (passive and active solar home with large garden, orchard and chickens). If Roger is not traveling or in his home office, then he is likely to be found at one of his children’s events (or visiting them), in the garden, at a music festival or out in the mountains exploring. 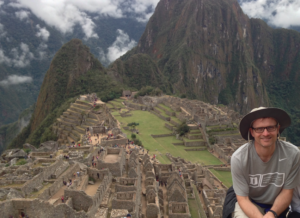 Interested in supporting the expedition? All unused funds will be donated to the WiSH Education Foundation. I'm in and committed. But any help to get there would be greatly appreciated.